C.J. 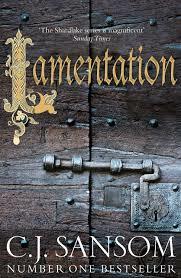 Sansom’s 2104 novel Lamentation brings to a close the his six book series of Henry VIII. Sansom brings the series to a close in great fashion filled with suspense, double-dealing and all of the intrigue surrounding the King’s court. Henry’s sixth wife, Catherine Parr, is the centerpiece of this novel set in the divide between conservative and radical factions at odds over England’s religious future. Catherine pens a secret paper, clearly outlining her leanings and of course it disappears and the Shardlake search for the potentially deadly manuscript begins. Catherine’s very survival is at the center of the story which begins with the burning at the stake of heretic Anne Askew and two others. Familiar territory for Henry VIII. Lamentation qualifies as a good read from every dimension. It appears to bring the Shardlake series to a close but I will leave those details to be discovered by the reader. If you have not read the Shardlake Sansom novels I commend the entire series to you. If you are committed, start from the beginning and read them in chronological order. Dissolution, Dark Fire, Sovereign, Revelation, Heartstone, Lamentation. The characters and story line build through each book. It may seem like a project but I suggest it will be well worth your while. Sansom is a celebrated historical novelist and you will become an enthusiastic student of Tudor England when you embark on the Shardlake journey. This entry was posted in Fiction, Historical Novels and tagged C.J. Sansom, Henry VIII, Lamentation, Queen Catherine Parr, Tudor England. Bookmark the permalink. Glad there were no spoilers, I am reading Lamentation now.